InnovOil - London – 24 July 2018 – Acoustic Data’s SonicGauge well monitoring system can provide real-time oil and gas well data. With every oil and gas company interested in increasing production to maximise the economic recovery of their assets, new downhole technology can also help these companies to streamline costs, delivering vital savings and revenue over many years through higher production and lower total cost of ownership. Oilfield services company Acoustic Data produces an acoustic telemetry system called SonicGauge, which is used to monitor wellbore pressure and temperature in real time. InnovOil spoke to Acoustic Data chief operations officer Gavin Lindsay and co-founder and chief commercial officer Jesse Tolley. The company was also co-founded by current CEO Mark Tolley, who began his career as a reservoir engineer before managing E&P companies around the globe. “When he was managing assets in the late 1980s in Australia, he was particularly frustrated with not having any real-time data for his wells,” said Jesse Tolley, “it was impossible for him to make informed decisions in regard to production optimisation. Lindsay stated that the main component in SonicGauge is an acoustic transducer that has been specifically designed to transmit data from depths, which can then be decoded at the surface. What sets SonicGauge apart from other well monitoring solutions is that it is plug and play. This makes it faster to set up compared to traditional cable-based systems, a relatively complex and time-consuming procedure. “We’ve got a 4-20 minute installation window in a new completion where we can have gauges installed to the outside of the tubing and everything up and running,” said Tolley. The tool’s design is also small and lightweight, which helps make it easy to install. “I flew up with a complete kit from Woking to Aberdeen; it fits in a hold bag,” Lindsay added. “You can take it out, literally in a suitcase and press two buttons on the surface decoder and the system is then up and running. So there’s no complexity to the install or the use,” he added. 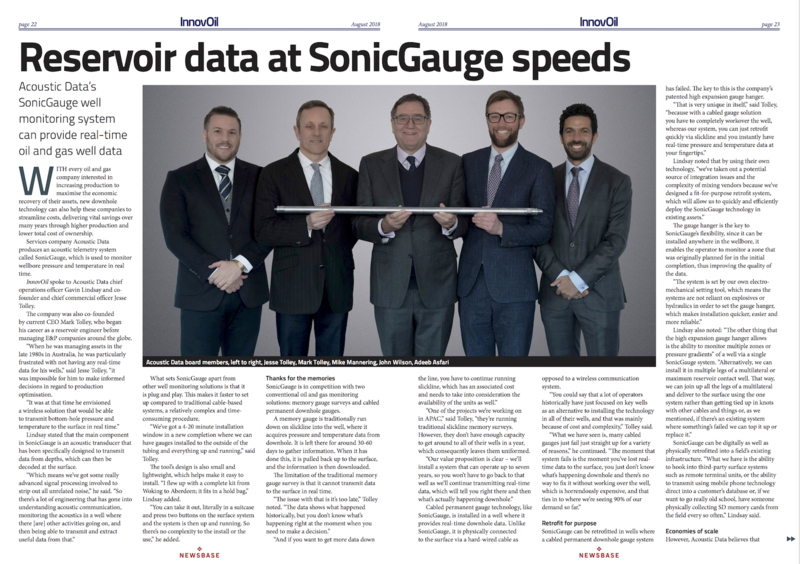 SonicGauge is in competition with two conventional oil and gas monitoring solutions: memory gauge surveys and cabled permanent downhole gauges. A memory gauge is traditionally run down on slickline into the well, where it acquires bottom-hole pressure and temperature data. It is left there for around 30-60 days to gather information. When it has done this, it is pulled back up to the surface, and the information is then downloaded. The limitation of the traditional memory gauge survey is that it cannot transmit data to the surface in real time. “One of the projects we’re working on in APAC,” said Tolley, “they’re running traditional slickline P/T surveys. However, they don’t have enough capacity to get around to all of their wells in a year, which consequently leaves them uniformed. Cabled permanent gauge technology, like SonicGauge, is installed in a well where it provides real-time downhole data. Unlike SonicGauge, it is physically connected to the surface via a hard-wired cable as opposed to a wireless communication system. “You could say that a lot of operators historically have just focused on key wells as an alternative to installing the technology in all of their wells, and that was mainly because of cost and complexity,” Tolley said. SonicGauge can be retrofitted in wells where a cabled permanent downhole gauge system has failed. The key to this is the company’s patented high expansion gauge hanger. Lindsay noted that by using their own technology, “we’ve taken out a potential source of integration issues and the complexity of mixing vendors because we’ve designed a fit-for-purpose retrofit system, which will allow us to quickly and efficiently deploy the SonicGauge technology in existing assets." The gauge hanger is the key to SonicGauge’s flexibility, since it can be installed anywhere in the wellbore, it enables the operator to monitor a zone that was not originally planned for in the initial completion, thus improving the quality of the data. SonicGauge can be digitally as well as physically retrofitted into a field’s existing infrastructure. “What we have is the ability to hook into third-party surface systems such as remote terminal units, or the ability to transmit using mobile phone technology direct into a customer’s database or, if we want to go really old school, have someone physically collecting SD memory cards from the field every so often,” Lindsay said. However, Acoustic Data believes that SonicGauge works better on more than just a well-by-well basis. “The real benefit is being able to install this type of system on a field-scale,” Lindsay said. “What we’re looking at is field-scale well-to-desktop production improvement, that type of approach where we can make a significant financial impact to the oil company or the operator across a large area for a long period of time. “The plug and play, ease of use is a key thing as well,” Lindsay said. “It means we can install equipment, as in the case of one of our larger projects on jackets, where maybe a traditional method might have required a larger intervention campaign or equipment. The power source for a SonicGauge monitor is two double C cells. 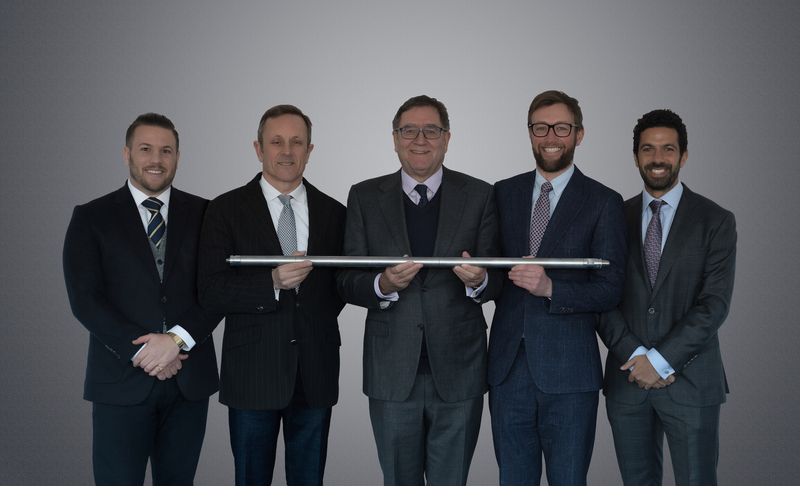 “The whole system downhole runs on something that’s inherently tiny,” said Lindsay, “just a couple of batteries for up to seven years of real-time data. By using the gauge hanger system, a SonicGauge system can be easily retrieved once the onboard batteries are depleted. This ease of access helps decrease operator maintenance costs as well. A key cost-saving advantage of the SonicGauge is that it is able to reduce the intervention cost versus some other systems on the market. In April of this year, the company closed an US$8 million investment from London-based growth capital investor Energy Growth Momentum (EGM). Acoustic Data intends to use the funds to scale up operations and grow its team in order to capitalise on increased demand for its proprietary wireless downhole pressure and temperature gauge system. In addition, Acoustic Data has used this investment to open their new 350-square metre Technology Centre and headquarters in Woking, UK, signalling their strong ambitions to disrupt the oil sector. “We’re about to start a major project in APAC right now,” said Lindsay, “and we’re looking at collaborating with a few other partners globally to introduce these types of wireless solutions, so it’s an exciting time, and I think it shows a shift in the way people are viewing the need for information that they can act upon.